A new range of industrial grade lifting bags and controls has been introduced by Enerpac for lifting, pushing, pressing or moving loads safely and smoothly. Enerpac offers nine sizes of the low clearance lifting bags which use compressed air up to 116 psi (8 bar) or water to achieve load capacities ranging from 3.1- 67.2 ton (27-656 kN). Enerpac lifting bags – which are Kevlar reinforced and “centre target” marked for optimised safety in use – complement Australia’s most comprehensive range of high-pressure (700 bar) hydraulic lifting equipment, which is engineered by Enerpac to pack more lifting power into a smaller space and makes cylinder placement simpler and safer. The lifting bags also complement Enerpac’s new system of plastic cribbing blocks and wedges which optimise safety when stabilising heavy loads after they have been lifted. Collapsed heights from 28-31mm for easy access under and around loads, with extended heights from 157-541mm. Aggressive high-friction surface to prevent bags from slipping. They can be stacked up to two bags high for extended lifting capabilities. Non-conducting rubber, which resists oil and most chemicals and has an operating range from 0-90 deg C.
Enerpac Regional Manager Australia and New Zealand Mr Tony Brooks says the big advantages of lifting bags include easy access to restricted spaces, such as those around awkwardly shaped loads or loads in confined spaces, for example. Restricted access situations can range from beneath vehicles and machinery being replaced, recovered or repositioned, to pipeline trenches and around resource and exploration equipment. 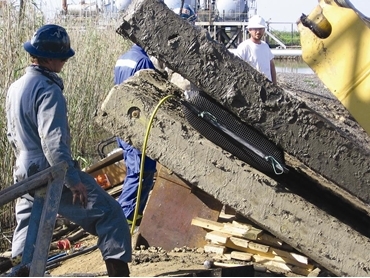 The lifting bags can also tolerate restricted surface pressure, which is useful when they are lifting from softer surfaces in trenches and tunnels, for example.